Christa loves to make it as fun and easy as possible to browse her store and go shopping! She offers Daily Deals, Weekly Specials, and free gifts with purchases of $25 or more. She also offers Free US Shipping all the time on every order, with no minimum purchase. Fabulous right?? She has an incredibly low international rate, too - just $10 for worldwide shipping, no matter where you live or how much you buy! The most popular items in her store are her precut fat quarter singles. Whenever Christa gets in a new line of fabric, the first thing she does is cut and fold hundreds of individual fat quarters so that they are stacked, bagged and ready to ship! Christa is also a prolific blogger where she shares weekly quilting tutorials demonstrating how to make her original quilt designs from start to finish. You can visit her blog here, lots of inspiration! Christa is offering a super awesome giveaway: a $25 shopping spree to her store. 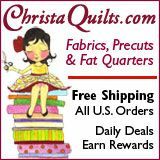 To enter, visit ChristaQuilts and sign up for her email newsletter, or follow her blog. Then leave a comment stating what you'd love to buy with your gift certificate if you win! Here's a special offer just for Quilt Story readers: use the code B12STORY to get an extra 5% off your first order from ChristaQuilts. Once Christa sees you use the code, she'll flag your account to receive 5% off every order in the future, with no further coupon needed. It's like a permanent group discount! This giveaway will remain open through Sunday, winner announced Christmas Eve!! Good luck! Also a follower of their blog. I'm loving all the Amy Butler FQs! Just signed up to follow her blog! Thanks for the chance to win. I'd have to get some of the wackier fabrics she offers, like the bacon print one. I love wacky prints. I might buy some Brooklyn Height textures if I won. I get her emails and follow her blog. I follow Christa's blog but didn't see where to sign up for her news letters. I would like to get them. HAPPY TO FOLLOW YOU AND CHRISTA QUILTS VIA BLOG LOVIN'! VISITED CHRISTA QUILTS+I'D CHOOSE "CHATEAU ROUGE" BY FRENCH GENERAL,IF I WERE THE WINNER! THANKS! I follow her blog and I would buy me some Gypsy Caravan. I already follow Christa's blog. Her shop is great to order from - deliveries come so quickly and you get free shipping! I'm trying to build up a stash of solids, and would probably use the gift certificate for that... but you never know, those prints are always so tempting! I follow her blog now! I think I'd pick some Oh Deer by Momo if I won. Flirt, 2DZoo Animals, Lark, Daisy Chain, Gypsy Caravan. So many fabrics!Love to look at fabric. Not as much as buying it but it's a high second best. Thanks. I follow Christa's blog and I would love to add some Gypsy Caravan to my stash! I follow Christa's blog and I would love to get the Ebony and Ivory FQ bundle. Love Christa's shop...I already follow her blog and receive her newsletter. I'd get some of the pretty batiks she sells. Thanks for the sweet giveaway! Ifollow Christa's blog and newsletter and I recently received my first order. It arrived so quickly and I really appreciated the ten dollar int l shipping! I think I would choose some Kaffe Fassetts or Laurel Burch midnight cats! I am a follower of her blog and I get the newsletter. I would order some Kaffe! I've signed up for the newsletter and follow her blog. I'd like to get some of the fat quarter singles so I can see what they're like before ordering a large amount. I already follow Christa's blog and get the newsletter. I would love to get the Santa's Helpers Green Sock Monkeys fat quarter bundle. I follow Christa's blog and I would get a Kona jellyroll since i have never worked with a jellyroll before. I would get some Kansas Troubles yardage. I love Christa Quilts! I've been going there for a few months now and keep going back. I think I am already on her newsletter list, but I will go make sure I am following her!!! Thanks for the great link! I've always wanted to get some Kaffe Fawcett, so I would probably start with that. I am new to quilting and would love the BB polkadot fabric to add to my stash! I follow Christa's blog. Thanks for the giveaway! Already signed up :) I'd love to get some charm packs for baby quilts! I signed up for the newsletter! If I win I'd probably buy an Amy butler print ! I do love LARK! Thanks for the chance! I receive Christa's newsletter. She has so many great collections and bundles. I especially like her Kaffe Cloissonne bundle. I receive Christa's email newsletter! I love the Kaffe Fassett fat quarters, particularly the lotus leaf and the paisley jungle fat quarters, and I love the Laurel Burch cat panel in rainbow colors! I became a blog follower. I would love to get my hands on some grinch fabric for stockings for my kids. Thanks for the giveaway! Oooh Ahhh! There are so many pretties... but at the moment I would select Kaffe Fassett Classics Cloisonne Floral!! I signed up to get the newsletter - thanks! I might buy the Ebony and Ivory fat quarter bundle. Too tough a choice! Thanks for the chance to make that tough decision! I get her emails - thanks to all for the chance for the giveaway! I would pick up some nice solids. I'm a followere of ChristaQuilts! I would also buy a selection of Kona solids - I have gotten a few from Christa before and I am trying to build up my stash! I follow her blog and receive the newsletter. Thanks for the chance to win! I get Christa's newsletter and follow her blog! I love Christa's. I don't recall how I found her but it is a great place to shop. I already get her newsletter. I would probably buy some solids. Thanks! I really love Oh Deer! By Momo. I think those pencils are what I'd buy...that's the first I've seen them, LOVE!! Love the 'Basic Grey' layer cake. Such pretty fabric! I'm following her blog via email. I'd get the pearl bracelet fat quarter bundle. Thx for the chance! I would use it to buy some of the Kona solids. Thanks for the chance to win. I already follow Christa's blog and get her newsletter. I would pick the baby blocks quilt in pink. I like that Christa's carries Kaffe Fassett fabrics. Kaffe Fassett's Classics Millefiore 8 Fat Quarters -- for my "one day" Kaffe quilt. I think I would put it toward a Sew Stitchy layer cake. Thanks for the chance! Amy Butler bundle for me. i follow her blog and would love some gypsy caravan! Wreath block tutorial and Merry Christmas! Fabric Tuesday, sorry I am late! The Quilted Castle Giveaway winner! A Joyful Soul Fabrics giveaway!! Fabric Tuesday- what have you done?